Vikings Go Berzerk is the latest game to be issued by Yggdrasil Gaming. The new pokie has a Vikings theme, which is apparent from the title of the game. The game is also the unofficial sequel to one of the most successful games by the developer. This game is Vikings Go Wild. This time, the Vikings have gone past going wild, and they have gone full on Berzerk, which is not as bad as it sounds. On the contrary, when the Vikings go Berzerk, they are going to help players greatly in winning great payouts as they rage on. So get ready for a wild and a totally Berzerk gaming experience with a group of Viking invaders. The best part is that the game can be played right here for fun. This way, players can check out what the game has to offer them prior to placing real bets on the slot. 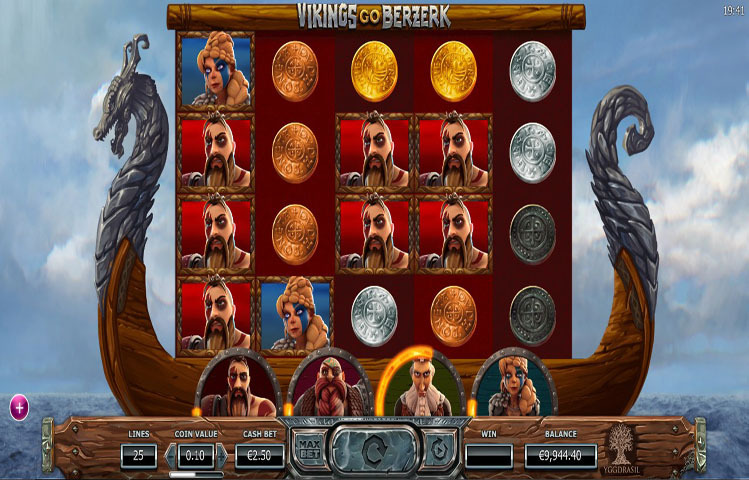 Vikings Go Berzerk offers players the chance to go on a Viking ship that is set for new lands. Players will get to join a group of Viking female and male warriors on that ship. These warriors are deadly, vicious and can go Berzerk at any moment. The Players will be waiting for that moment so they can claim great rewards. Players will explore new lands with these Northern warriors for a chance to claim its fortunes as their own. Players can claim these fortunes by forming winning combos on the 25 lines of the game. That is not all, as there is the Raging meter, the Berzerk mode, free spins and a wild icon. All of which would help players enjoy a lucrative gaming experience. This does not really come as a surprise. This is because the game is from the portfolio of Yggdrasil Gaming. From the moment players open the game, they will find that the game is inspired by the Viking warriors. This is why the reels are located on a Viking ship that is sailing in the open seas. They would also see the different Viking warriors with Raging meters underneath the reels. As for the symbols, they include the ruthless Viking warriors, golden coins, silver coins, the golden wild, the Viking ship among other symbols. The game has a golden wild on top of a Viking pattern. This wild can substitute for all other icons on the reels of the game to help players get paid. The wild will not replace the scatter free spins round icon. The free spins icon can trigger a number of free spins, whenever players get from 3 to 5 of them on the game’s reels. During which, Vikings can become sticky wilds if they manage to beat the Siren. There is also the raging meter that can cause Vikings to go Berzerk and trigger 7 free spins.